It was covered dish night at Evening Prayer. Because of the food allergies in our family, I try to prepare (okay, or purchase) food so my people can eat and be satisfied. I was taking a crockpot of macaroni and cheese, so after I got that started I began thinking about what dessert to take. Desserts are pretty important, because I don’t ever want my girl to feel slighted or left out. And let’s face it, when you can’t have dessert, that can make you pretty sad. I pulled out one of my Mama’s cookbooks–the last one she got, I’m pretty sure. I flipped through. I thought about a cake and then about cookies. I love to bake, but nothing was suiting me. Then I flipped through and came to pies. I haven’t made one in quite a while. I like to make pies, and if I wasn’t mistaken, I had two pie crusts in the freezer. Since the advent of food allergies, we haven’t had one of those. IN YEARS. I read through and was pretty sure I had all of the ingredients. The story behind it was what reeled me in and sealed the deal though. I found a story that told how during the Civil War folks were short on pecans. Since their families loved pecans and pecan pie, the women did something that I grew up watching my Mama do. I love stories of people who make incredible things happen even when maybe they don’t–at first glance–have all they need to have to bring it to fruition. Those are the best stories. As I began to mix the ingredients, I realized I didn’t have white Karo syrup. Actually, in all honesty, maybe I shouldn’t say I didn’t have it–the truth would be that I couldn’t find it in my pantry. Rather than give up the plan, inspired by the ingenuity of my foremothers and my own Mama, I looked up alternatives and used the right proportions of water and sugar and voila! We had a pie mixed up and in the oven. I usually don’t do that–take something I’ve never made before to a public gathering. The fact that I did is a testament to the spirit of the people I sit with on Sunday nights. They are adventurous and gracious and loving. And I hope truthful. Because they said it was wonderful. The best part was the look on my girl’s face when I put a slice on her plate. Dessert? Yes, please. I will make the extra effort every single time, just for that look on her face. Tonight I’m thankful for the women and men on this journey who might be slowed down by the situation or by what they don’t have, but who are rarely stopped. And never for very long. They make do and create beautiful things despite their hardships or lack of the traditional set of “tools” in their kit bag. 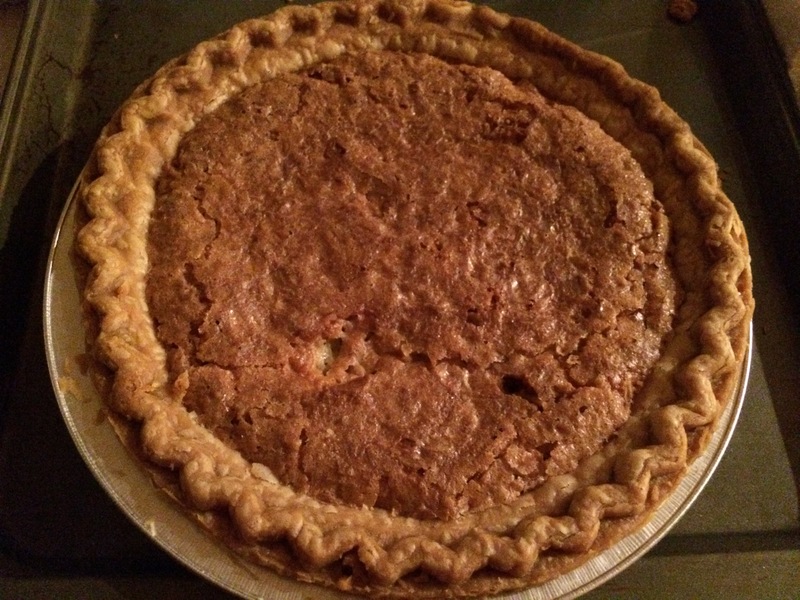 Most of all I’m thankful for a recipe found at just the right time and for the smile that pie put on my girl’s face. May we all have a “make do/can do” spirit that makes this world a better, happier place for all of us. “Pecan” pie from oatmeal? Who’d a thunk it? And, as my dear friend pointed out, add a few banana slices–it can make a pretty wholesome breakfast too. (Bread, oatmeal, eggs, fruit…..right?) Delicious and versatile. It doesn’t get better than that. And because I love y’all, here’s the recipe for you to give a try. Mix well. Pour into unbaked pie shell. Bake about an hour at 350 degrees.